Tiny Cracker Zoo by Christopher Master is joining the 100 trees Project! An amusing anthology of eight shamelessly true stories that peels back the flannel veil, Tiny Cracker Zoo by Christopher Master beckons readers to revel in the savory agony of Master’s existence amidst fanatics of fast cars, wild game, and a grouchy God. Such a profusion of personal information is seldom heard outside of a psychiatrist’s office. Curious? Good! Because this is really a great a book, and not only that but it also has joined the "100 Trees Project"! This joint program was launched by Infinity Publishing, a leading self-publishing company together with Eco-Libris to promote environmental sustainability among its authors. Through the program, authors that publish with Infinity are able to plant 100 trees for the title they publish. These authors also have the option to add a special "100 trees planted for this book" logo to their book's design, as a way to showcase their commitment to environmental sustainability. 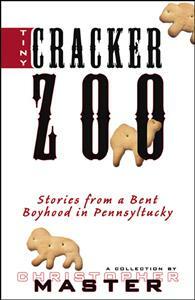 What Tiny Cracker Zoo is about? Truth, some believe, is stranger than fiction—even well-written pulp fiction featuring ridiculous man-sized outhouse leeches or a homicidal, incestuous hillbilly clan. However, as a recent television series so cleverly proved, the search for truth can be a more fascinating journey. With this in mind, I’ve compiled these short stories chronicling the droll occurrences of my formative years in bucolic Pennsyltucky. These deliciously embarrassing experiences embody just a few of my attempts at developing a resistance to the subtle tickle of detachment I felt between myself and virtually every denizen of my simple rural community. Despite enduring many years within the numbingly blissful cocoon of Pennsyltucky, I now run Infinity Publishing’s cover design division. When not obsessing about the television show “Lost,” I sit in front of my computer trying to transcribe my memories though I inevitably get distracted by my feverish zeal for toy robots in disguise. In spite of this torrid love affair with my abundant collection of shape-shifting Transformers, I have been blissfully married to my beautiful, patient, and vastly smarter wife Marianne for over 3 years. We have two cats who are also smarter than I am. Tiny Cracker Zoo is available for sale on Infinity's website.